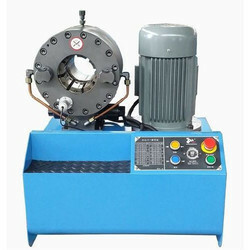 Our organization has set the benchmark in offering Hydraulic Hose Crimping Machine to our clients. It operates using less electricity and power. This product has sturdiness and is resistant to chemicals and abrasion. Experts have manufactured this product using advanced technology. This product is ideal for small and medium batch production of high-pressure hose assemblies. Hydraulic Hose Crimping Machine has high utility in industrial applications.